Each of us has a favorite food, a favorite book, a favorite movie. My favorite foods are blueberries, cheese, chocolate, and coffee. (I eat more blueberries than cheese or chocolate. Coffee…well that is its own food group). My favorite book is “The Catcher in the Rye”. My favorite movie is “Babe,” a wonderful tale about a pig who challenges orthodoxy and changes his fate by embracing an unlikely career. I also have some favorite organizations. One of them is Growing Power, a Milwaukee-based, national nonprofit organization whose mission is to support people by helping to provide equal access to healthy, high-quality, safe and affordable food in all communities. Growing Power implements this mission by providing hands-on training, the demonstration of best practices, outreach/education, and technical assistance. Growing Power has been a defining presence in the (re)emergence of urban agriculture in the United States. The organization catalyzes projects all around the nation. Growing Power was created in 1993 by Will Allen. Will Allen’s biography is, well, amazing. Raised on a family farm, Allen has had a varied career. A former professional basketball player and marketing professional, an author and speaker, Allen is also a farmer. For his work in urban agriculture, Allen has received recognition from the Ford Foundation, the MacArthur Foundation "Genius Grant” and the Kellogg Foundation. He is both prophetic and particular: he inspires, but he also provides important and specific information about the art and science of food production. 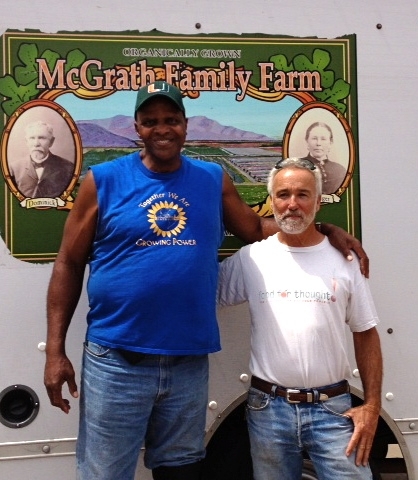 On a recent day, Allen visited Phil McGrath’s farm in Ventura County. He was visiting Southern California as part of a multi-state project in which UC ANR’s Rachel Surls is engaged. A small group of us joined Will for a tour of Phil’s farm. I’ve visited Phil’s farm before, but each time, I learn new things. I have a few takeaways from listening in on a conversation between two of my favorite farmers. One is that farmers speak the same language. They share their best practices, their hopes, their aspirations. They are generous. They are civic minded. They want to learn, and to teach. They work in challenging and ever-evolving situations. For example, US 101 and an airport border Phil’s land. Some adjacent farmland has recently been sold for development. In the next few years, Phil will face more pressures on his farming operation, as what was once a rural setting becomes the peri-urban interface. Phil’s family – his ancestors immigrated from Ireland - has been farming locally for generations; the landscape as they experienced it has changed vastly. Another takeaway is the vital role that farmers play in educating youth and the public about their work. In any educational work about agriculture, producers ought to be front and center. (And I wish they were in classrooms more often. Food systems ought to be part of our new national core curriculum). Phil’s innovative operation is full of young people, many of whom never envisioned agriculture as a career opportunity. Although he educates people of all ages, Will’s work in Growing Power initially started out as a program that offered teens an opportunity to work at his store and renovate greenhouses to grow food for their community. Growing Power provides one of the best models I’ve seen for youth education, and perhaps more importantly, for youth engagement and empowerment around the food system. My third takeaway is this: I learn new things every time I visit a farm. It’s an opportunity I cherish, an opportunity to regenerate, to renew my appreciation about where my food comes from, and to engage with the most wonderful kinds of people. I feel a special connection to both of these farmers. Both inspire me. Ventura County is my home. I value its producers, including Phil. And as a descendant of Dutch nationals who immigrated to Milwaukee (some later pushed west to farm in Iowa), Growing Power holds a special place in my heart. No matter where you’re from, food is fundamental. Cherish farmers. rohsik: Thanks for good information.